Dr. Dabas has immense experience as a Head and Neck Onco surgeon in treating all types of Cancer patients in leading centers in New Delhi. As a Professor of Medical Oncology, his clinical focus is on the treatment of cancers of the oral cavity, oropharynx, larynx, thyroid, parotid, skull base, esophagus, lungs, and mediastinum. He is pioneer of Robotic Head and Neck Surgery in India and International mentor of Robotic Surgery. 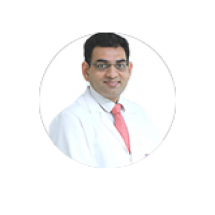 He has been actively involved in teaching Robotic Surgery across India. He has over 20 years of experience of satisfied patients in his field. He was a Chief of Head and Neck Oncology and Robotic Surgery in Rajiv Gandhi Cancer Institute & Research Centre.He has done maximum number of Robotic Head and Neck Surgery in Asia. Dr. Surendra has numerous National and International publications. He has started Robotic Surgical Fellowship in Head and Neck Oncology. He presented paper on “TORS in Head and Neck Cancer and our experience” at China in May 2014.